Over the weekend, I was in Dollar Tree in Carrollton when I walked past the end of an aisle. "Did I just see a teacup on that birdhouse?" I backed up. 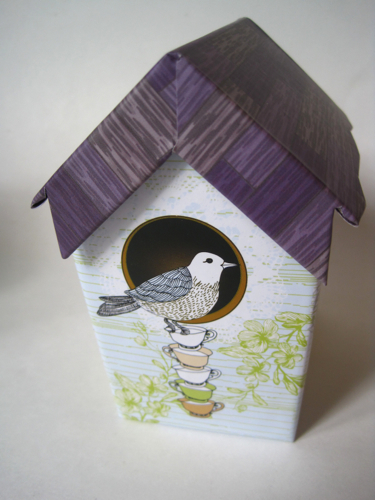 Yes, yes I did see a teacup on that birdhouse. 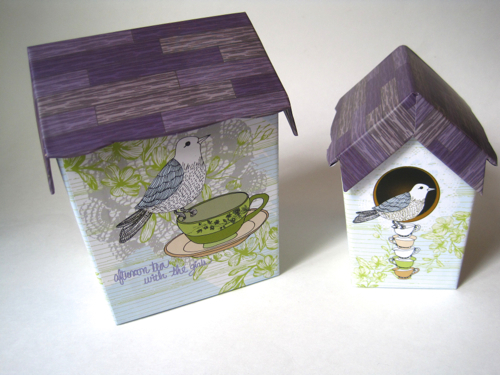 Actually, these are birdhouse gift boxes, and aren't they cute? The taller one is about 6-1/4 inches tall, the smaller one about 5 inches tall. "Afternoon tea with the girls," it says. I immediately got one of each size because I'm sure I will need a gift box for a tea lover at some point, and these will be perfect. Here's a side view. Cute! 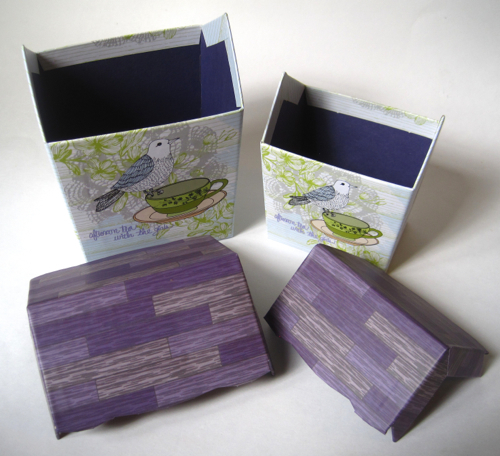 The lids slide right off, but once they're in place, they're actually pretty snug. 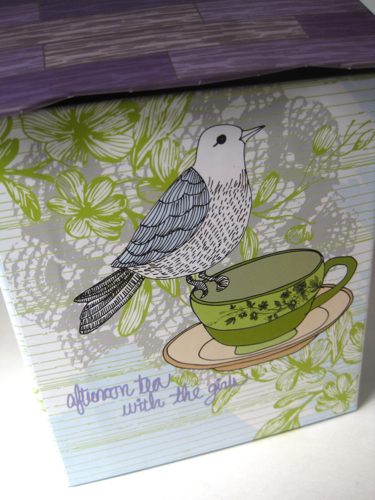 So if you need some cute gift boxes, head thee to Dollar Tree. I firmly believe my tea-loving friends should scoop these up before anyone else gets to them! 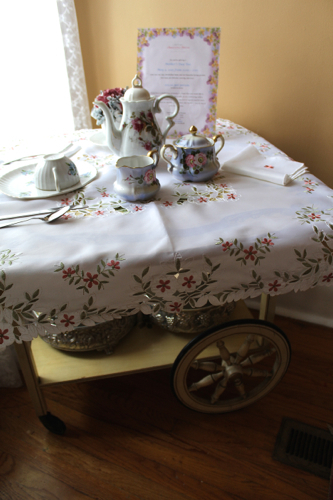 When I was at Something Special last week and saw their cute tea trolley, it reminded me that I had not yet decorated mine for April, and time was fading fast! 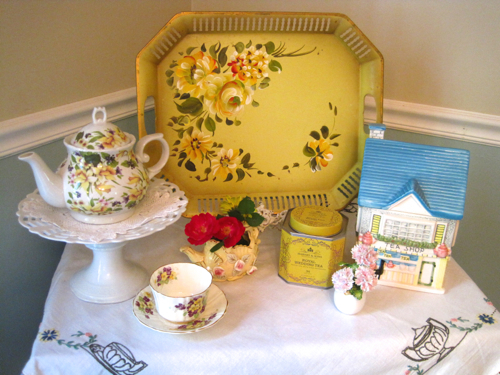 This year, I wanted to see if I could pull together a few yellow things that were not my Royal Winton Welbeck pattern dishes, which I love but have featured for the past few years. It was time for something different. So even though I don't have that many yellow things (yellow not being a color I decorate with very often), I was able to gather enough for a small vignette. 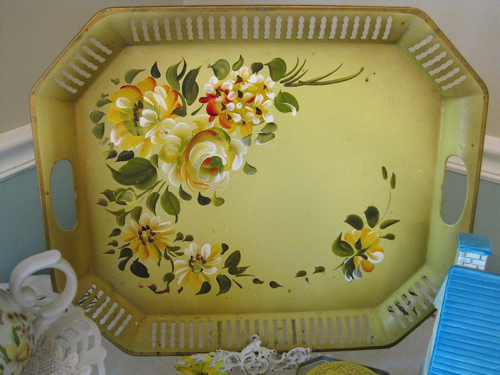 This yellow tole tray was something my mom found for me years ago, back when I was into collecting tole trays but not paying the high prices they were commanding at the time. I don't think she paid more than about $3 for one. 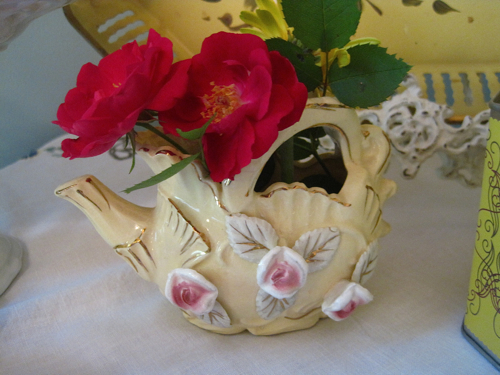 This little teapot vase is something I found in an antique mall years ago. I've never seen one quite like it, and it's perhaps the sweetest little vase I've ever seen. 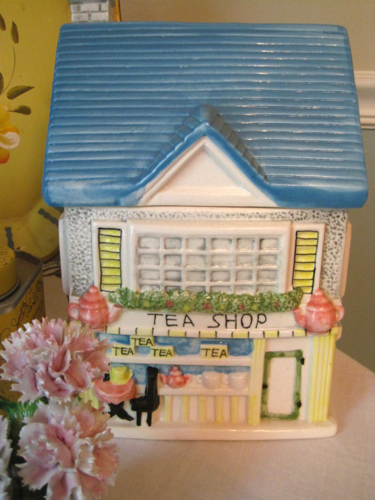 This Tea Shop cookie jar has a little yellow on it, so I decided it could go. 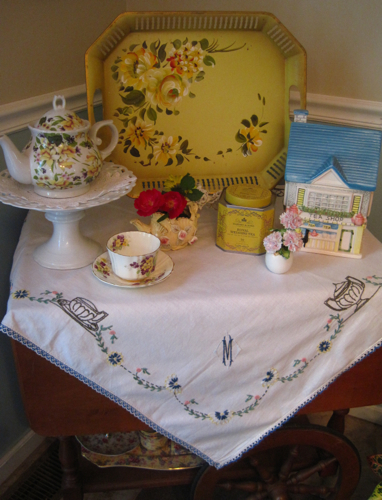 Underneath it all is a vintage tea-themed embroidered tabecloth. 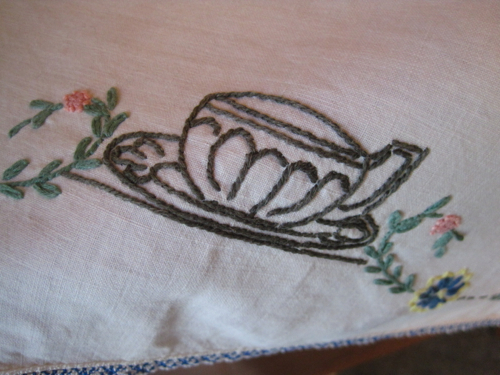 The sides have a teacup, teapot, sugar and creamer embroidered on them. And the tablecloth also has an "M" embroidered on it, so when I found this on eBay, I definitely had to have it. 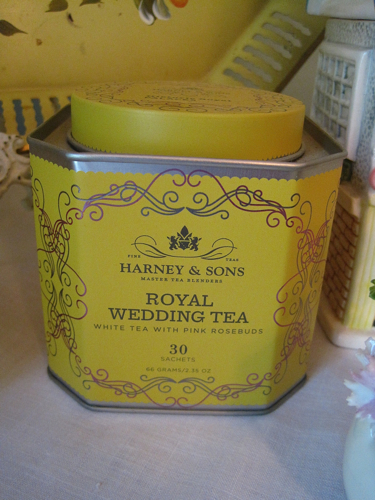 Who kept their yellow tin of Harney Royal Wedding Tea when Will and Kate got married? I'll bet I'm not the only one! And I've saved the best for last, something that's not yellow but is part of the display anyway. 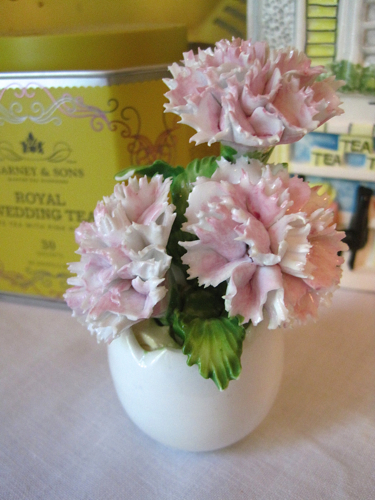 It's an amazing little floral gift I recently received from sweet tea friend Michele. After all my woes about trying to cook the perfect hardboiled egg, she finally just sent me this one—of bone china—filled with carnations! Now, I can't seem to send a greeting card these days without it getting mangled in the mail, but she wrapped this super fragile piece so carefully, it arrived in perfect shape. 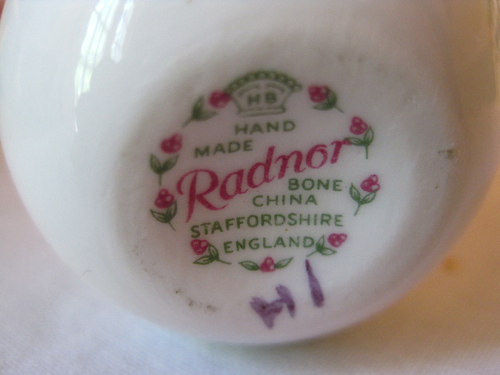 "Hand Made Radnor Bone China, Staffordshire, England." Have you ever seen a porcelain egg vase before? I never had, and I'm so happy to have this adorable piece gracing my tea trolley! An early birthday gift of azaleas! 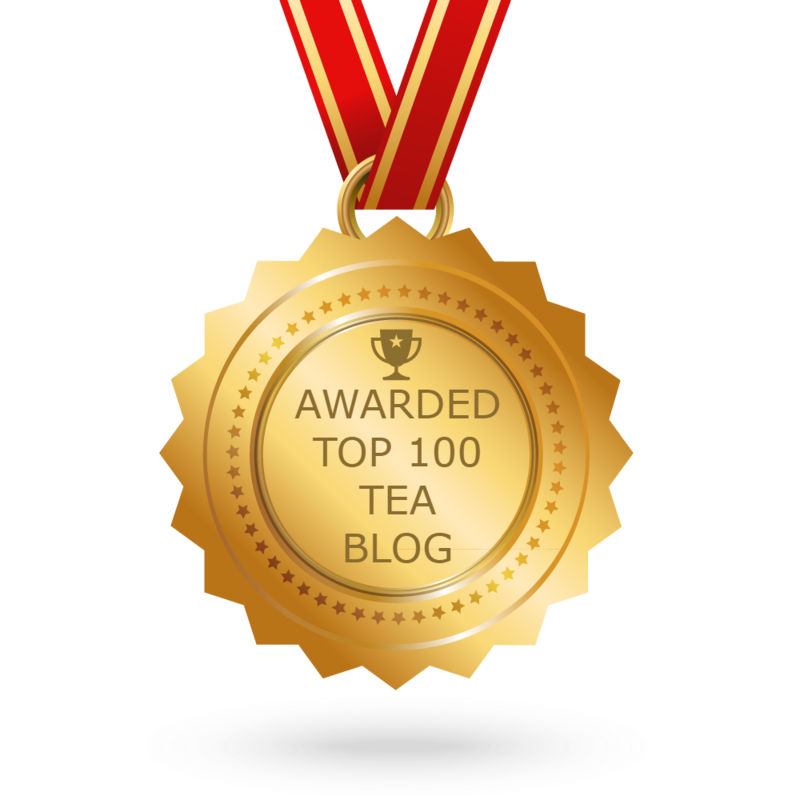 I am forever amazed by the kindness of tea friends! Last week, Frances L. sent an e-mail saying she knew I had a birthday coming up and to expect a package. She hinted it had something to do with the azaleas I blogged about earlier in the week, and I wondered if maybe she was sending me an azalea cutting. It didn't dawn on me that it might be teawares! 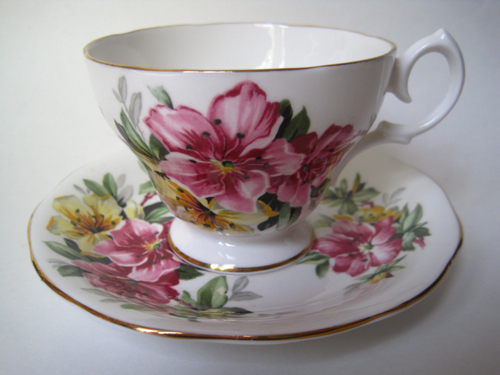 When the package arrived, I discovered this beautiful vintage English teacup and saucer, made by Queen Anne, inside. 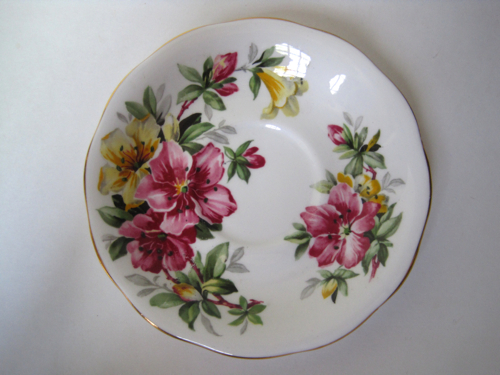 I almost never see azaleas on a cup and saucer, so I was especially delighted to receive such a lovely and thoughtful early birthday gift. It made my tea taste better that day, too. Funny how that works, isn't it? 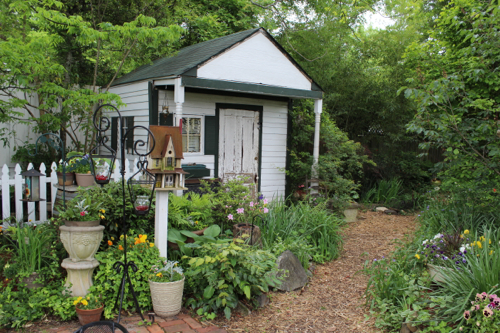 Finding tea … along the garden path! Last week, our Chamber of Commerce had its monthly networking social at Something Special, the local special events facility known for its elegant weddings, meetings and other special events such as the lovely Christmas Tea I attended in December. I arrived early in hopes of getting a few "quiet" photos before the crowd arrived, and this lovely home and garden was at its springtime finest! Here, is one of the many scenic spots in the backyard garden where, not surprisingly, a great number of the guests chose to mingle. It was hard to pick a favorite scene, but this fountain was certainly one of my favorites! 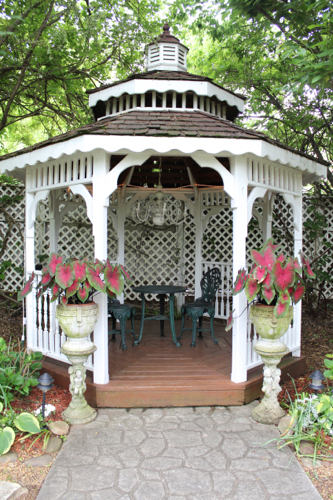 Then again, the gazebo was lovely as well. 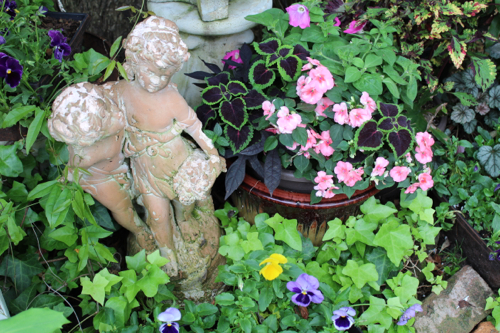 As was this sweet spot with statuary, pansies and ivy. But once everyone arrived and I did my customary mingling with friends in the business community, I knew I could head back up front and have this little corner to myself, the home of a gun cabinet which once belonged to owner Mike Meyers' grandfather — a gun cabinet now being used as the "tea party cabinet," as Mike put it! 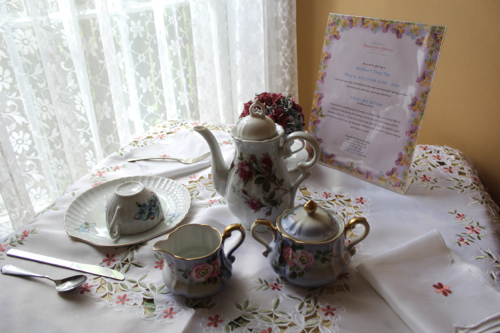 Nearby, a tea trolley was set up with a vignette promoting the upcoming Mother's Day Tea at Something Special. If you're a local reader — or within driving distance of Newnan — this tea is set for Saturday, May 9, from 11 a.m. to 2 p.m., and I can tell you from past experience that any tea held at Something Special is going to live up to the name. 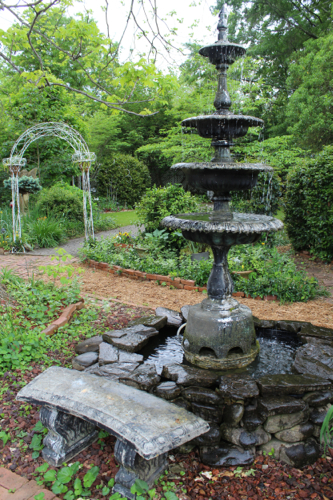 For $25 per person, including tax and tip, you can tour the home and gardens while treating your mother to a wonderful time of tea. (And I trust if you are blessed enough to still have your mother, you are doing something special for her, whether or not it's at Something Special!) Mike says he can reserve a spot for you if you call in with your credit card information, and he can be reached at 770-251-1206. 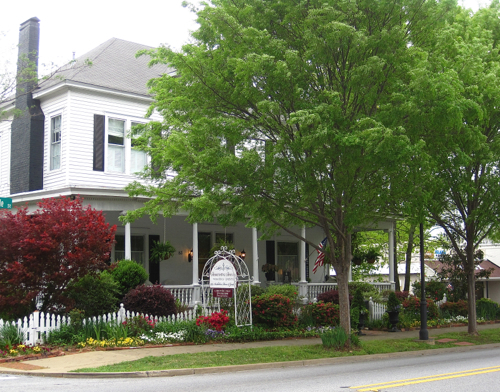 And even if you don't live nearby but simply want to see more of this lovely antebellum home, you can visit their website at sspecial.net! Cathy loved to decorate, and while she wasn’t into high-end design projects, she dearly loved to spruce up a room. In the kitchen, she would regularly hang new curtains over the kitchen sink. In the living room, she liked to switch out the pillows seasonally to bring new color into her decor. That big skirted table in her bedroom? It was forever being redecorated, sometimes with vintage books or, in summer, seashells collected on family beach trips. But much as Cathy loved to decorate, in her dining room was one small vignette she’d been enjoying for months and never intended to change—ever. To the casual visitor, it was simply a handsome oak cabinet displaying some vintage Japanese teawares in front of sepia-toned photos. Cathy usually favored a more streamlined look over a cluttered one, but every time she walked by the busy little tea scene, it gave her no small amount of pleasure to know these teawares were out where everyone could see and enjoy them. The handpainted tea set featured a scene from a Japanese garden. The set had belonged to Cathy’s great-grandmother and, through various handings-down in the family, eventually became hers. While her closest friends were quite familiar with the tea set, new friends would see the prettily faded photos behind the tea set and ask if that sweet little golden-haired child with the big bow in her hair was an ancestor. 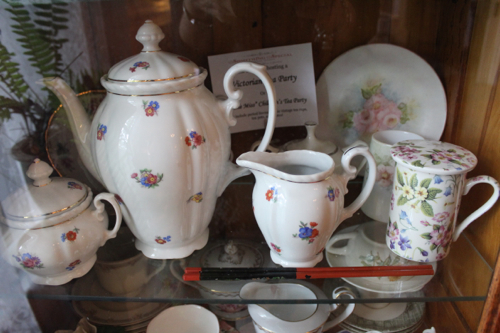 “Yes, that was my great-grandmother, and this tea set once belonged to her,” Cathy would reply. And that was the truth. But it wasn’t the whole truth. The fact of the matter was, her great-grandmother—“Great-grandmother Lucille” as she insisted the great-grandchildren call her—was a stuffy old biddy. She wasn’t a loving mother to Cathy’s grandmother, she had never been very fond of Cathy’s mother, and Cathy remembered her simply as the unpleasant old woman who spent the last years of her life terrorizing the rest of her family. She never played with her grandchildren and great-grandchildren—“too rambunctious,” she always said—and family lore had it that she probably nagged her poor husband to an early death. 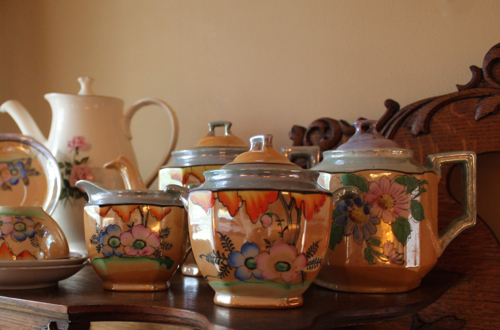 Cathy’s mother once told her the real story behind Great-grandmother Lucille’s tea set. When Lucille married Cathy’s great-grandfather, a wealthy young banker named Harold, they’d gone on a tour of the Orient for their honeymoon. One of the many objets d’art Harold purchased for Lucille on that trip was a Japanese tea set that caught her fancy. Was the tea set used with her husband or perhaps her children and grandchildren? No. 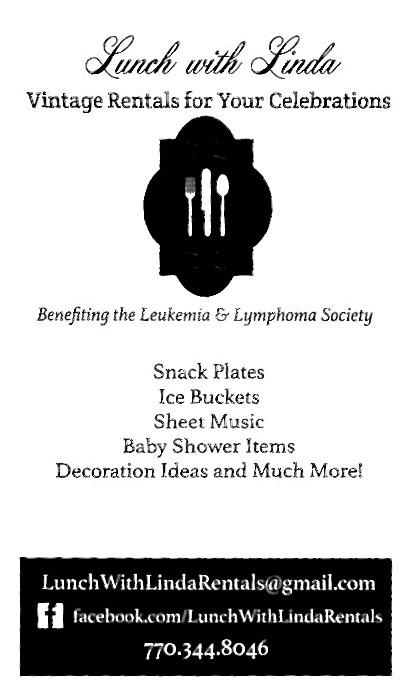 Had it provided hospitality at women’s club meetings and library fundraisers? No. Instead, Great-grandmother Lucille would pull out the tea set once a year to admire it, show off her priceless pieces of “art,” and reminisce about her and Harold’s honeymoon to any unfortunate relatives who happened to be within earshot. Then, she would wrap each of the pieces back in a soft cotton cloth and have the tea set returned to the attic for another year. While Cathy never had great reason to dislike her great-grandmother, she didn’t have warm feelings for her either, primarily because of the way the woman had treated her own daughter and granddaughter. Cathy often marveled that some of her friends went around pretending they had always had such perfect families when, in reality, everyone’s family was usually dysfunctional in one way or another. When Cathy inherited the tea set, she knew immediately that the revered pieces of “art” were going to have a new set of house rules. Cathy invited her mother over one Wednesday morning for brunch. They had a delicious quiche and some fresh fruit, and in the center of the table—right there in front of God and everybody—sat the infamous honeymoon souvenir that had spent a lifetime largely in hiding, Great-grandmother Lucille’s Japanese Tea Set. Her mom had stared at the set wide-eyed when she first realized Cathy was actually using the sacred teawares. She never said a word about it, but Cathy suspected her mother was quietly pleased. 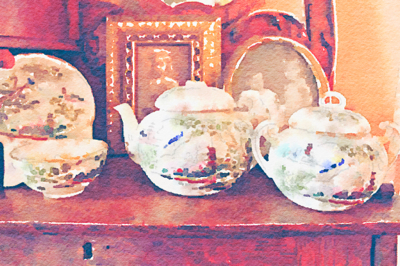 The photo of the smiling little blonde—the photo tucked behind a teapot on the old oak cabinet—had more than one story to tell. There was the story of a happy young child who grew up to be a very different sort of older woman. And then there was the story of the woman who overvalued her things. Cathy could honor her great-grandmother for being part of her heritage, but she could also learn from the mistakes her great-grandmother had made. Lucille had valued things more than people, and Cathy wasn’t about to follow in those footsteps. 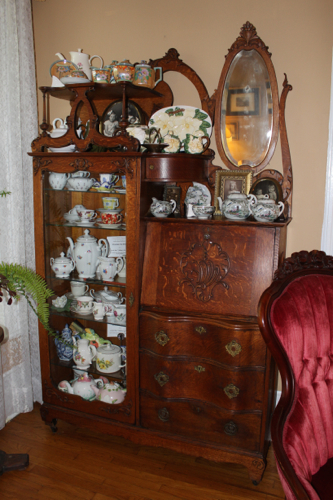 Every time she walked by the oak cabinet, she was assured that the Japanese Tea Set would have a new story, a better story, to tell the generations to come. 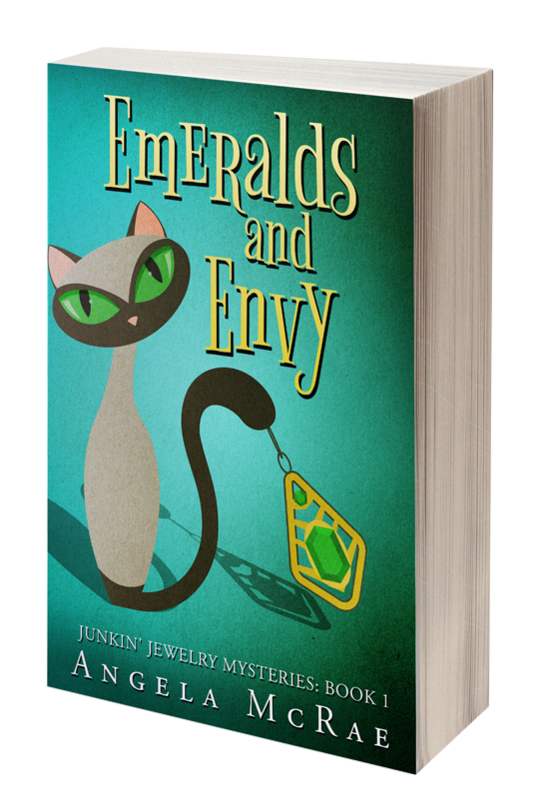 A few details for new readers … and old! Today I wanted to address a couple of questions that have come my way in recent weeks. Now some of you are going to say, "Well, duh? Who didn't know that?" and the answer is, "I didn't … not always, at least!" Occasionally someone asks about a post they saw on this blog in the past but can't remember when it ran. The great thing is, that small box above my name — the rectangular box to the right of the orange Blogger icon and with the little magnifying glass icon inside, is the search bar. I outlined it in red above to show you where to look, because it's a very helpful tool and one I use all the time. On my blog as well as others, I find myself wanting to revisit a blog post from the past, and this search bar makes that easy to do. 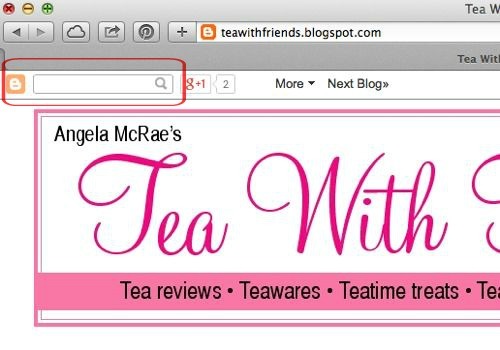 Not long ago, for instance, I wanted to revisit some of my friend Phyllis' many posts about "Downton Abbey" on her Relevant Tea Leaf blog, so I simply went to her search bar and typed in that name, clicked Enter (or Return) on my computer, and up came all those great posts! A couple of people have told me they are sharing my Saturday Teatime Tales with their friends (thank you, thank you, thank you! 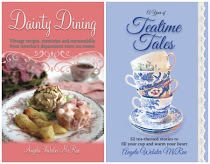 ), and those are all labeled "Teatime Tales" and can be accessed by scrolling down the lists on the right-hand column on this blog. 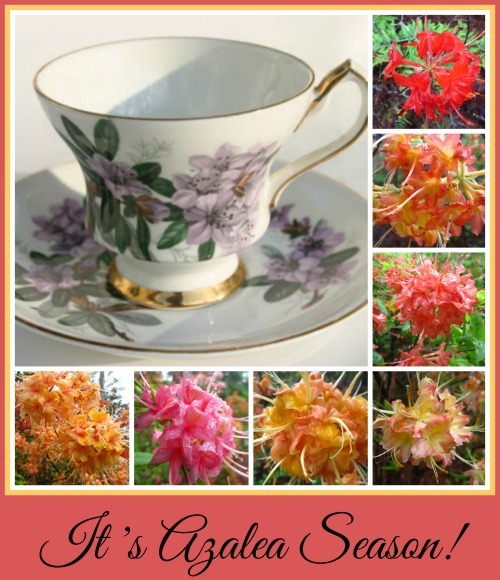 Under the heading "Labels," you will find a number of my Saturday projects from the past, such as the 52 weeks of tea room postcards and 52 weeks of tea room recipes. If you click on one of these titles, it will bring up ALL of the posts under that particular topic. So there you go! These are some search techniques I didn't know when I was a new blogger, and for new readers, I thought it might be helpful as well. Happy searching! This week I finished a big editing project, so I celebrated with a little downtime, which meant reading something a bit more leisurely — my beloved back issues of Victoria magazine. My custom for years now has been to reach for issues originally published in the month at hand, and I best love — and cherish — those early ones. 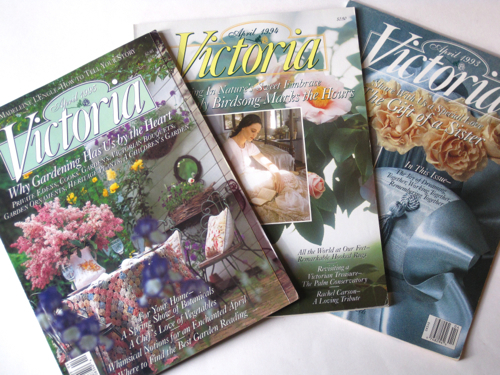 So this week I'm looking at the April 1993, 1994 and 1995 issues of Victoria. Can you think of a 20-year-old issue of *anything* that you still read? Other than these magazines, I can't, and I'm so pleased I've kept them all these years. As I look through these old issues, it occurs to me, repeatedly, that Victoria is truly what turned me on to tea. As a good little southern girl, I grew up drinking only sweetened iced tea, so the very concept of drinking hot tea seemed a little odd to me. But I loved all the pretty teawares in Victoria, so the teacup and teapot–collecting bug hit — and, naturally, an interest in tea books. 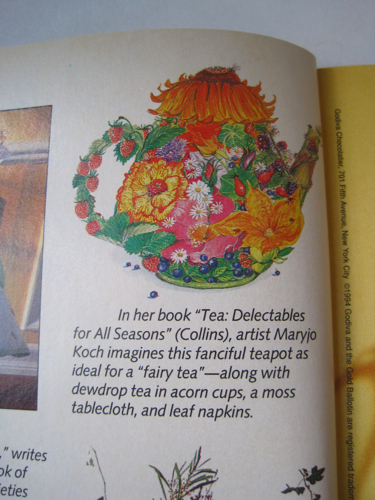 Looking back at tea-themed artwork in this April 1995 Victoria, I see that I missed a tea book, the one by Maryjo Koch. 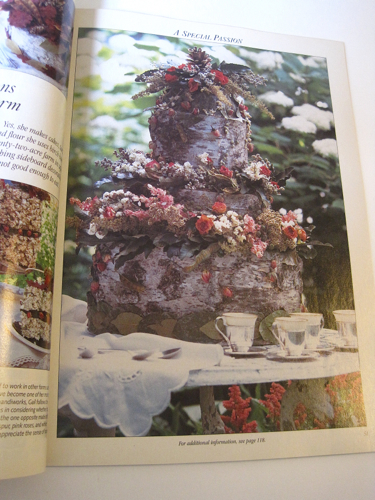 In this April 1994 issue, there's a feature titled "Woodland Confections Good Enough to Charm," which is about baker Gail Peachin, who made confections out of bark, rosebuds, pinecones and other natural elements. I can't help wondering if this "cake" with teacups nearby inspired some of the nature-themed creations that are still in style today. 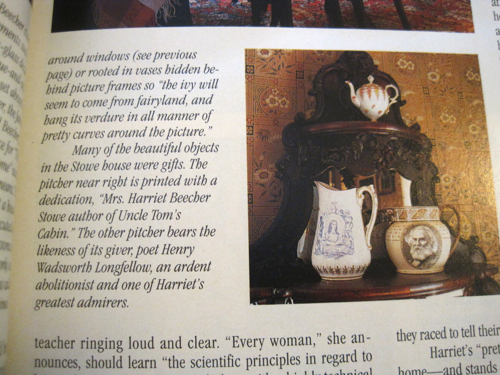 In the April 1993 issue, a feature on Harriet Beecher Stowe's cottage in Hartford, Connecticut, caught my eye with the teapot and pitchers shown here. 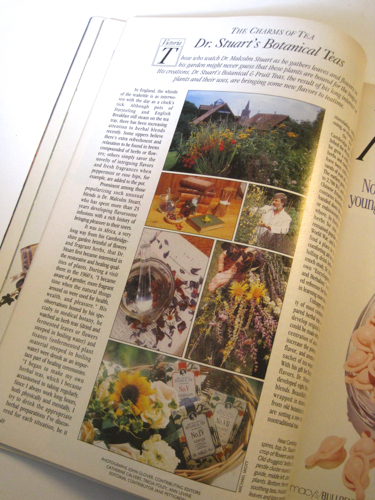 Also in the April 1995 issue was a feature on Dr. Stewart's Botanical Teas, which I remember enjoying many years ago and which I learned are still around today. Reading these old issues is rather like having a visit with a long-lost friend, a friend forever welcome in my home. 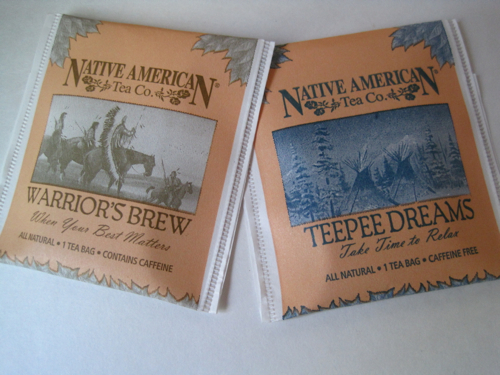 Recently I was contacted by the Native American Tea Company with an offer to sample some of its teas. I was unfamiliar with this company, and I learned that its founding family "would listen to the old ones tell stories of herbs, flowers and roots — where they came from and how they came to be put on the earth." The company was started in 1987 and began formulating herbs into tea one tea bag at a time. My sample package arrived this week and contained four different varieties of tea. The first two I tried were the Warrior's Brew and the Teepee Dreams. The Warrior's Brew contains Orange Pekoe tea, orange peel, rose hips, coriander, cinnamon, ginger, rosemary and star anise. This spice tea reminded me of Constant Comment but was lighter and with a softer, almost creamy quality to it. There's a real art to crafting a spice blend of tea that's exactly right — not too spicy, not too weak — and I think this tea gets it just right. 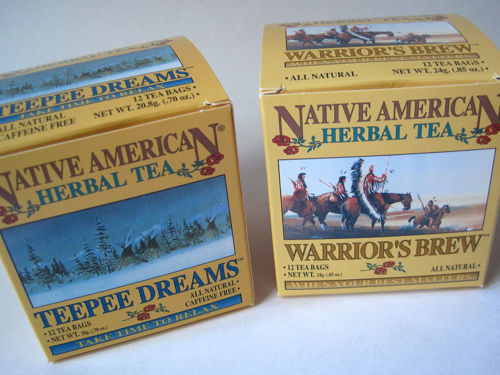 The other tea I tried is the Teepee Dreams, a caffeine-free herbal tea which contains peppermint, chamomile, catnip, strawberry leaf, linden, passion flower, scullcap, licorice root, Valerian root and natural flavor. I do enjoy chamomile tea, but sometimes the chamomile flavor is overpowering. This one is blended well with the peppermint, and I was pleased that I could taste both peppermint and chamomile in equal measure. I also think it's noteworthy that this company donates a portion of its profits toward scholarships at Sitting Bull College. 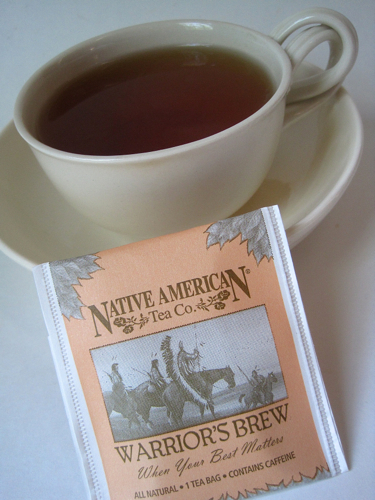 If you'd like to learn more about the Native American Tea Company, just click here. 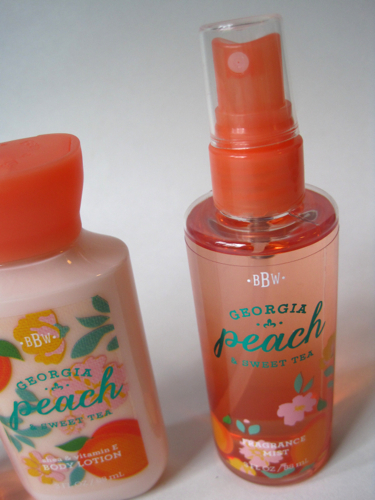 My tea friend Janet P. in Texas sent me an alert that Bath & Body Works has a new fragrance line, Georgia Peach & Sweet Tea, so naturally I was inspired to pay a visit to my local store. I asked the sales clerk about this new line. She said a new shipment of that very fragrance had just arrived and fetched some from the back for me. The travel sizes were three for $12. 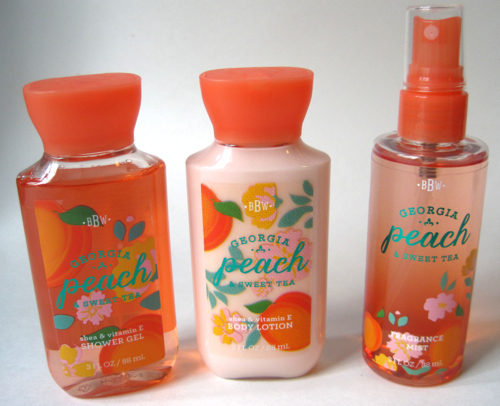 I got all three travel-size products of the Georgia Peach & Sweet Tea fragrance. It was a wise choice, because this fragrance is one I love-love-love, and I don't triple-love very many cosmetics. 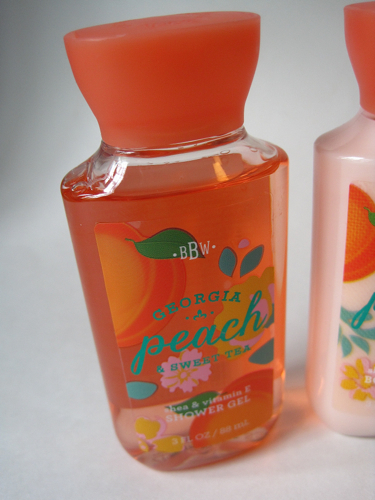 The mist in particular somehow captures just the right peachy notes of a peach, yet it's light and pleasant enough that no one will mistake you for, say, a Peach Cobbler. And while camellia sinensis isn't on the ingredients list, I still love the idea that I'm *wearing* a little tea when I use these fragrances! 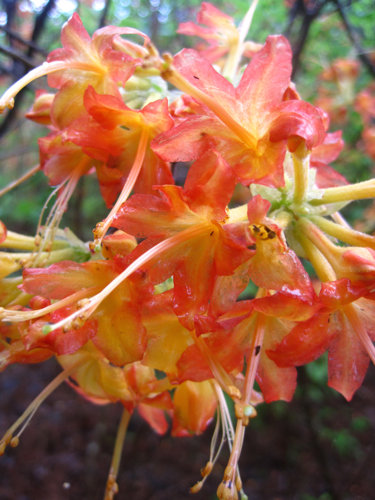 On Saturday, some members of my garden club braved the on-again, off-again rain to go tour my friend Joan's azaleas. 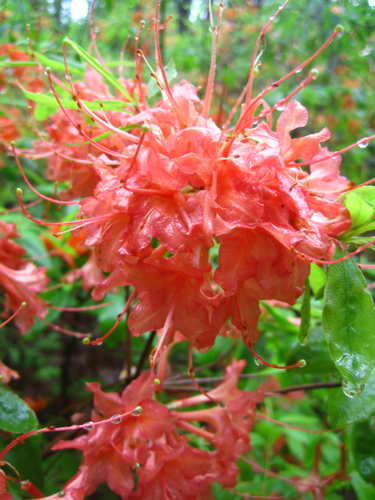 Joan has what some say is the largest personal collection of native azaleas in the US (some 6,000 plants! 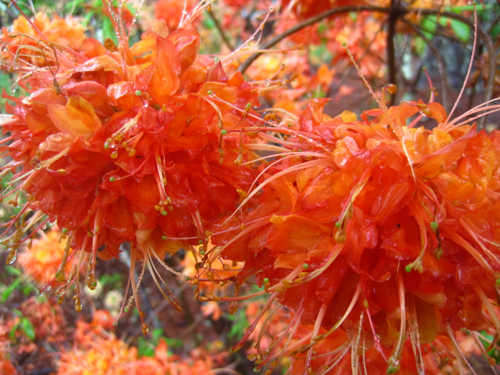 ), and even in the rain, these flowers are absolutely stunning! I'm pretty sure it was after touring Joan's gardens some years ago that I was inspired to acquire the only azalea teacup I've ever found. 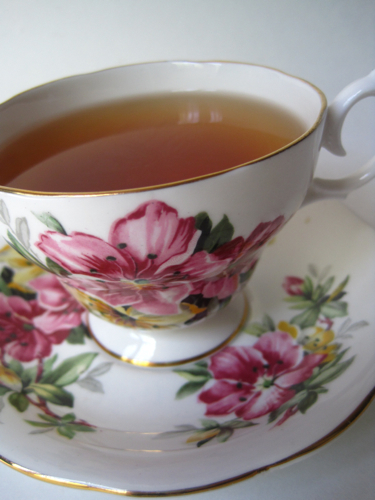 Roses, daisies, daffodils, chrysanthemums and lots of other flowers are regularly seen on teacups, but I don't believe you'll often see azaleas on one! 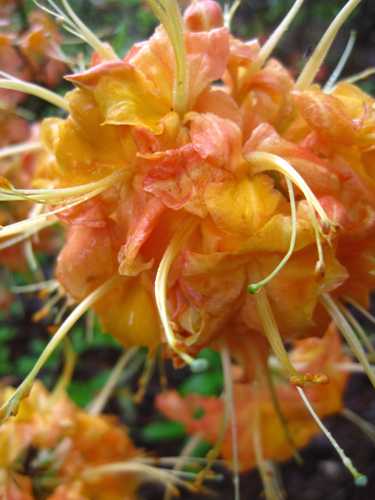 Several years ago, I read a book by British author Jane Brown titled "Tales of the Rose Tree: Ravishing Rhododendrons and Their Travels Around the World" which helped me understand the difference between rhododendrons and azaleas. 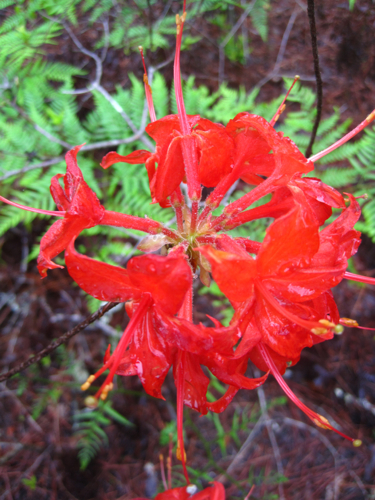 My main takeaway from the book: "All azaleas are rhododendrons." 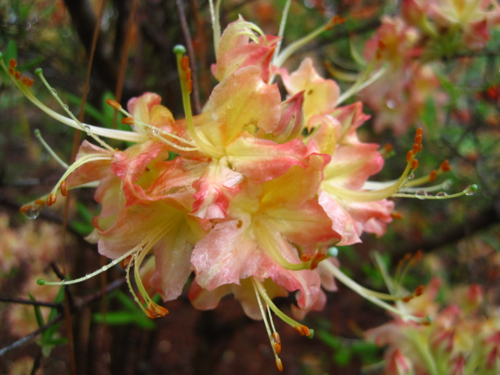 And if you really like to split hairs, as I sometimes do, the UGA Extension Service says, "All azaleas are rhododendrons, and both are in the genus Rhododendron. 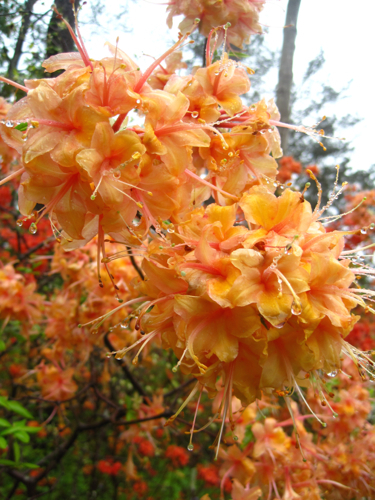 The term 'rhododendron,' however, is commonly used to refer to the group of plants usually with large, leathery, evergreen foliage, while 'azalea' refers to those with smaller, thinner leaves." Like a lot of southerners, I have long loved our spring azaleas, and when I read this passage in Jane Brown's book, I loved them even more: "Old as they are, rhododendrons are descended from the more ancient magnolia (Magnoliaceae) and tea (Theaceae) families and so have ancestral connections to the tulip trees (linodendron), camellias, stewartias and the franklinia." 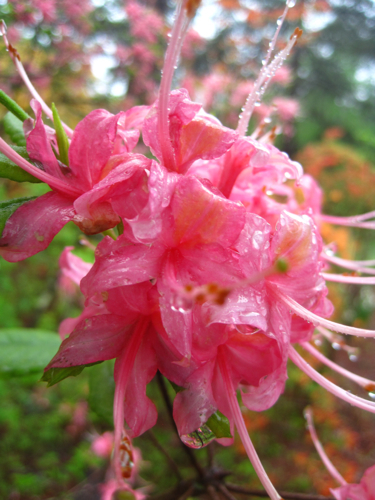 So next time you're enjoying the beautiful colors of spring azaleas, you can derive a little tea-lover satisfaction from knowing that the camellia sinensis plant we're so fond of is also a relative of the azalea. And just because the flowers are so pretty, I thought I'd share a few more photos from Saturday's tour. Are any of you azalea fans? A quickie teapot earrings giveaway! New Teapot Collector Mystery: "Shadow of a Spout"